WWE Rumor: Former RAW Champion to join SmackDown as part of Superstar shakeup? 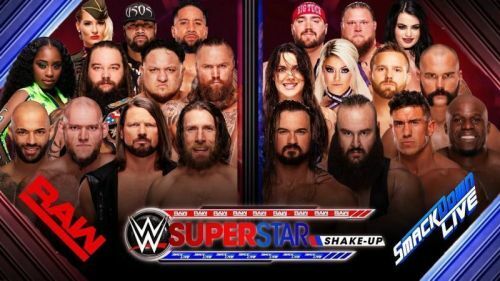 Who will join SmackDown Live tonight on part two of the 2019 WWE Superstar shakeup? Former WWE SmackDown and RAW Women's Champion Alexa Bliss has hinted that she will be joining the blue brand as part of night two of the company's annual Superstar shakeup. Joining the main roster in 2016, Bliss has established herself as one of the top stars in the women's division, becoming the second ever SmackDown Women's Champion at WWE TLC: Tables, Ladders and Chairs that December, and the fourth RAW Women's Champion at Payback 2017. Holding five Women's championships across both brands, Bliss' in-ring career was put on hold in late-2018, after suffering an injury. Despite this setback, WWE has continued to use Bliss first as a manager, then as the leader of the RAW Women's division, and most recently as a talk-show-host for her show 'A Moment of Bliss'. After hosting WrestleMania 35, Bliss has now returned to the ring. Taking to Twitter, the five-time Women's Champion said that last night's appearance on RAW may have been her final appearance on the red brand. Using the hashtag #Superstarshakeup, the petite powerhouse made it clear what she meant. If she was drafted to the blue brand, this would be her third drafting overall, as she was called up from NXT to SmackDown Live as part of the 2016 brand extension, and was drafted to Monday Night Raw the following year. The second night of the WWE Superstar shakeup will take place in a few hours, and will take place at the Bell Centre, in Montreal, Quebec, Canada. WWE Chairman Vince McMahon has said that the biggest acquisition in SmackDown Live history will be joining the blue brand tonight during the shakeup.